Cooper Hewitt, Smithsonian Design Museum presented “Beauty—Cooper Hewitt Design Triennial,” the fifth installment of the museum’s popular contemporary design exhibition series. Organized by Assistant Curator Andrea Lipps and Senior Curator of Contemporary Design Ellen Lupton, the exhibition explored beauty through seven lenses: extravagant, intricate, ethereal, transgressive, emergent, elemental and transformative. Otaared and Mushtari by Neri Oxman were displayed. New York Fashion Week, held in February and September of each year, is a semi-annual series of events when international fashion collections are displayed by designers from all over the world. In 2016, designers ThreeAsFour featured two 3D printed runway designs, the Harmongraph dress and Pangolin Dress. Clothes that respond to the environment, are ingeniously constructed from recycled materials, and garments that come off a 3-D printer ready to wear—all of these innovations are poised to have a profound impact on the future of the fashion industry. Designers have embraced these innovations and “#techstyle” explores how the synergy between fashion and technology is not only changing the way designers design, but also the way people interact with their clothing. The exhibition draws on the MFA’s collection of contemporary fashion and accessories, and features key pieces from innovators in the field including a digitally-printed dress from Alexander McQueen’s Plato’s Atlantis collection (Spring/Summer 2010/2011) and Iris van Herpen’s 3-D printed dress (2013) produced in collaboration with MIT designer and assistant professor Neri Oxman. Visitors experience the cutting edge of hi-tech fashion with special commissions created by CuteCircuit, Hussein Chalayan, Kate Goldsworthy, and Somerville-based Nervous System. Neri Oxman and IVH, ThreeAFOUR and Francis Bitonti all featured 3D printed fashion in the show, collection of Stratasys. Bretomer and Noitena by artist Nick Ervinck were displayed. Manus x Machina features more than 170 examples of haute couture and avant-garde ready-to-wear, dating from the early 1900s to the present. The exhibition addresses the founding of the haute couture in the 19th century, when the sewing machine was invented, and the emergence of a distinction between the hand (manus) and the machine (machina) at the onset of industrialization and mass production. It explores this ongoing dichotomy, in which hand and machine are presented as discordant tools in the creative process, and questions this relationship and the significance of the long-held distinction between haute couture and ready-to-wear. The Costume Institute's spring 2016 exhibition explored how fashion designers are reconciling the handmade and the machine-made in the creation of haute couture and avant-garde ready-to-wear. Showcased in the exhibition were two dresses by Noa Raviv. The 10-room exhibition, ran during the Venice Architecture Biennale, celebrating the life and works of the world-renowned architect, who passed away in 2016. 3D Printed chair, designed by the late Zaha Hadid with Patrick Schumacher was displayed. The Kunstgalerij De Mijlpaal in Belgium opened its doors to a fascinating exhibition entitled “Colours of the Sky”. Aiming to interpret and reflect the beauty of the sea and sky, the exhibition focused on artists whose works explore the effects of color and light. Myrstaw designed by Nick Ervinck was displayed. VOXELWORLD in collaboration with Lexus, presented the Belgian Artist Nick Ervinck with his 3d-printed art pieces at the ART.FAIR. The fair for modern and contemporary art. Our universe is of perennial interest, appearing in art all around the world as an object of worship and study over the centuries, and spawning countless stories. Comprising four sections entitled “How Have Humans through the Ages Viewed the Universe”, “The Universe as Space-Time”, “A New View of Life – Do Aliens Exist?” and “Space Travel and the Future of Humanity”, the exhibition attempted to explore these age-old questions from an artistic perspective. The exhibition presented around 200 items from throughout the centuries and across the globe in its quest to answer these existential questions – ranging from meteorites and fossils to the historical scientific material of Leonardo da Vinci and Galileo Galilei. Neri Oxman featured her works Zuhal and Qamar at his event. In 2016, designers ThreeAsFour featured two 3D printed runway designs. Bringing together corporate collections from around the world in order to reflect on the future and the responsibilities of corporate collections with a view to fostering adequate and innovative practices in a constantly changing environment. 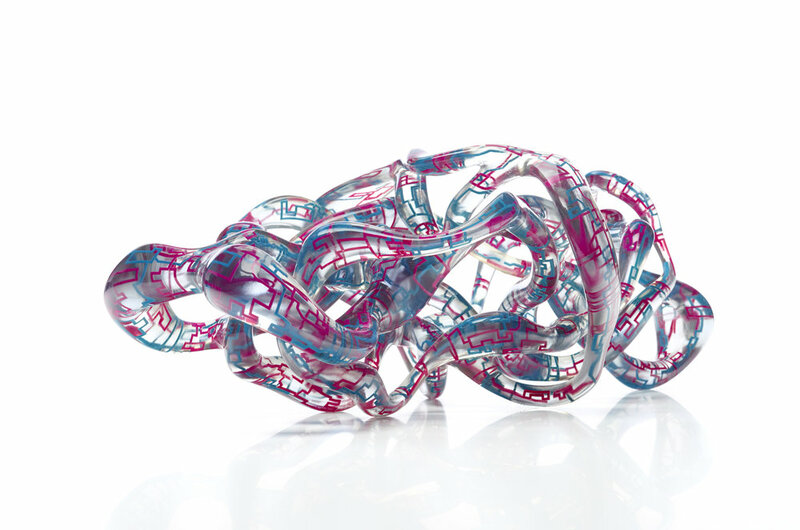 3D printed artworks from Nick Ervinck, Neri Oxman and Jose Sanchez were displayed. Man Made BC - AD works by Dov Ganchrow and Ami Drach were displayed. ART COLOGNE is an art fair for international art galleries presenting art of the 20th and 21st centuries in Cologne, Germany. It is the oldest fair of its kind having started with just 18 galleries in 1967. Today around 200 commercial galleries come together each spring to present works by over 2.000 artists, covering all price segments from well-known blue-chip artists to the newest young and emerging artists. Nick Ervinck, in collaboration with Voxeljet, featured Wolfkiam, Bretomer, Gnilicer and Noitena. The New Ancient Collection featuring 15 masks by Neri Oxman were displayed.